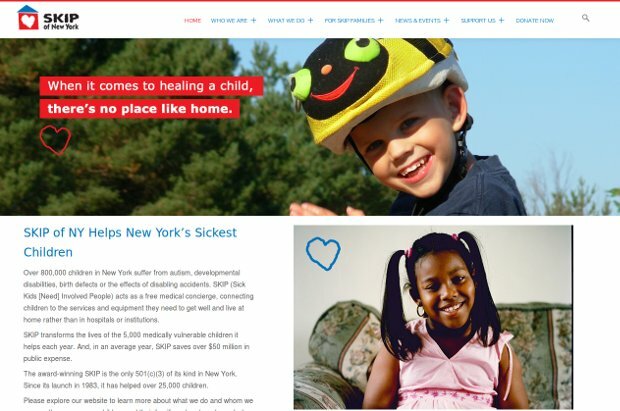 Sick Kids need Involved People (SKIP) of New York is a not-for profit agency for families who want to care for their chronically ill, medically fragile, or developmentally disabled children. SKIP is an advocacy and service agency that helps families who have seriously ill children access the necessary resources and support to enable them to live at home with their families. It helps set in place the health insurance and services required for these children and serves as collaborative and innovative stewards to these families and children as they navigate the health care system. It insures that families remain equal partners with professionals in determining their children’s needs. SKIP’s mission is to restore and maintain the primacy of family and home for sick and/or developmentally disabled children in the state of New York. Through its advocacy and support, SKIP helps families navigate the “no’s” and the bureaucracy to access the services required to care for these children in their own homes, giving them their childhood and enabling them to reach their full potential.